St. Louis / East St. Louis – Ee-Jay Motor Transports, Inc.
Ee-Jay is set on 18 Acres in East St. Louis, IL. Comprising of home offices, 120+ jumbo railcar storage, full service maintenance & repair facilities, state-of-the-art trailer cleaning facilities and warehousing / packaging facility with truck & rail docks. Modern two bay tank wash facilities equipped with the most modern Gamajet trailer washers and high pressure product hoses and rear filter canister cleaning appliances. Platform scale equipped with an electronic digital printer ensures accurate loading and inventory. Rail track storage for over 120 jumbo railcars. 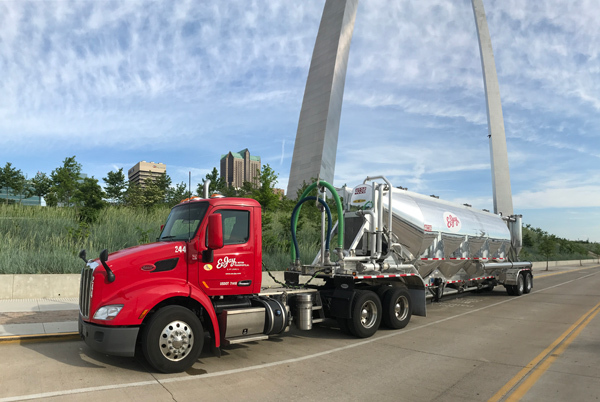 Making our St. Louis facility the largest and most experience bulk plastic resin handler in the Central Midwest area. Fully equipped maintenance facility for complete maintenance for all company equipment. Onsite warehouse facility for customer storage, transferring or packaging to and from Bulk Tanks, Railcars and/or Gaylord Boxes.